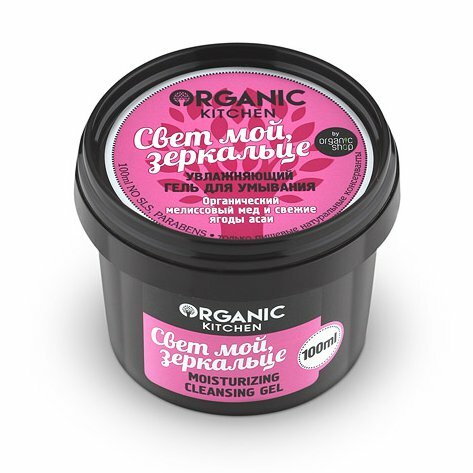 Magic Mirror Moisturising Cleansing Gel is produced by the Russian beauty brand Organic Shop for its Organic Kitchen series. It was inspired by the story of Snow White: “Mirror, mirror on the wall, who's the fairest of them all?” Not only does it gently cleanse it your skin, but it also actively moisturises it, helping to keep the skin young and beautiful. The product is formulated with organic lemon balm honey that deeply nourishes and conditions the skin. Fresh acai berries have a pronounced hydrating effect, soften the skin, stimulate skin cell regeneration and restore your skin's natural elasticity. Tiare flower oil extract (monoï oil) has moisturising, rejuvenating, nourishing and softening properties, improves skin elasticity and helps it to retain moisture. Magic Mirror Moisturising Cleansing Gel does not dry your skin or make it feel tight. It has a light, pleasant scent and a thick texture. The product is SLS free and paraben free. Directions. Apply onto wet skin. Lather with light, circular motions. Rinse with water. Ingredients. Aqua, Sodium Coco-Sulfate, Lauryl Glucoside, Cocamidopropyl Betaine, Glyceryl Stearate, Organic Mel, Euterpe Olecacea Fruit, Cocos Nucifera Oil, Gardenia Tahinensis Flower Extract, Parfum, Benzoic Acid, Sorbic Acid. Want to buy Magic Mirror Moisturising Cleansing Gel? Call us or submit your order via our web site!